This year, the UPPAbaby Mesa Merino wool lineup reaches new heights of style and comfort with a gorgeous modern cut, additional padding, and fabrics that are even softer than before! As a part of this lineup, the Henry Mesa was hugely popular in 2017, and now it makes a triumphant return for 2018. Newly added to the Merino wool lineup is Jordan (Charcoal Melange/Silver/black Leather). The Henry Mesa and Jordan Mesa are the ONLY car seats to pass federal safety standards without the use of fire-retardant chemicals, doing so with a brilliant and innovative use of Merino wool. A car seat cannot be sold without first passing federal fire safety testing (specifically, FMVSS302). While the Mesa line already meets flammability standards even without the use of brominated and chlorinated chemicals used by traditional manufacturers, the Henry and Jordan Mesa go a step beyond with their innovative use of Merino wool. Merino wool is finer and suppler than normal wool and possesses a natural flame resistance. Where other materials may melt or burn, Merino wool resists catching fire when exposed to flame, allowing the Henry and Jordan Mesa to pass fire safety testing without the use of chemicals. It’s not possible to say enough good things about Mesa’s amazing Merino wool blend. In addition to it’s fire resistance, it also possesses wicking properties that keep babies cool on hot days and warm on cool days, and its gorgeous, gender-neutral blue marl fabric is calming and soothing for you and baby, all while reassuring you with its safety standards. 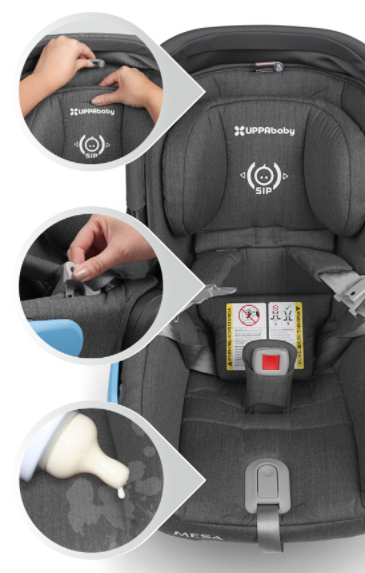 MESA’s adjustable headrest is reinforced with EPP foam providing added protection for your child. The integrated design keeps an infant’s head stationary during a side impact collision. MESA’s unique no-rethread ﬁve point harness eliminates the need to take apart the harness system as baby grows, providing reassurance the harness is installed correctly each time. The MESA paired with the VISTA or CRUZ stroller delivers a Performance Travel System that is the ultimate in portability and safety. No need to sacriﬁce performance for convenience. An industry ﬁrst, MESA is the only infant car seat with a unique technology utilizing a tightness indicator and self-retracting LATCH connectors for fast, accurate and easy installation. An indicator window changes from red to green for visual conﬁrmation the base has been installed correctly every time. When the tightness indicator turns green, it provides conﬁrmation that the seat is installed correctly whether using LATCH or belt. Unlike traditional LATCH connectors, MESA’s unique retracting LATCH system tightens effortlessly, minimizing installation error. MESA’s integrated headrest design keeps an infant’s head stationary during a side impact collision. MESA’s Side Impact Protection is incorporated into the shell construction and adjustable headrest that moves as baby grows. EPP foam-constructed wings distributes crash forces, minimizing head trauma and whiplash. babies as large as 35 pounds. Sign up and be the first to know about our promotions, offers, coupons, as well as our giveaways and events, both in-store and online. The brands we love: Bugaboo, Uppababy, Clek, Diono, Babybjorn, Baby Jogger, Beaba, Thule, Ergo, Mountain Buggy, PegPerego, Maxi-Cozi, Chicco, Graco, 4moms, Skip Hop, Vonbon, Little& Lively, Minimoc, NorthFace, Sorel, Stonz, Mymayu, Bogs and more. Active Baby is your top Canadian Online Baby Store with store locations in North Vancouver, Langley and Vancouver. Active Baby specializes in top branded baby gear, unique locally made baby items, specialised outdoor gear for kids, organic eco-friendly baby clothing and more. Owned by parents and run by parents, we know first-hand what’s best for our children, and we’re proud to provide our customers with the best baby products in Langley, North Vancouver BC Canada and the world. We take pride in supporting local businesses and are more than happier to hear what our customers have to say about our baby gear and organic, eco-friendly baby products. Combined with professional advice and exceptional customer service, you won’t find anything at any other Vancouver baby stores like what you’ll find at Active Baby. © 2019 Active Baby Canadian Online Baby Store | All prices are in CAD | Canadian Baby Store.